Most smartphones currently in the market conform to a common design with fewer innovations being seen in this market. The LG G Flex and Samsung’s Galaxy Round are among the few that have broken ranks by coming up with curved displays. Russian telecomm spinoff, Yota has also recently launched a device that features 2 screens – a 4.3″ front display (1280x720pixels) and a rear e-ink display designed for low power consumption. At 640×360 pixels, the e-ink display is legible even under the glare of sunlight affording the reader a minimal e-book reader. Real time information from your social media accounts and emails can also be accessed on this display. The device can also receive calls at critical battery levels courtesy of the e-ink display, which makes it a major differentiating factor in the market. Connectivity on the device is provided through LTE, HSPA, Wi-Fi, 802.11 a/b/g/n and Bluetooth 4.0. The device is currently available in Germany, Russia, France, Austria and Spain. It is expected to reach other European markets starting January 2014. Yota CEO expects that other device manufacturers will copy their design once the YotaPhone achieves its sales targets (currently set at 500,000 devices) in the next 2-3 months. 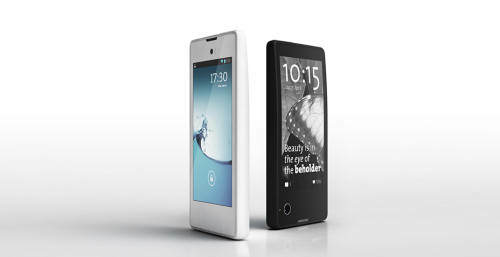 YotaPhone currently costs 499 euros.